For those of you who follow my blog, you know how picky my family is about desserts. Picky, picky, picky. I could complain about it, but guess who’s also a picky, picky eater? ME! That’s why I started cooking and baking. If you don’t like something, make it yourself! The one dessert that will always make my husband and girls happy eaters is a moist, tender, buttery, vanilla cake. My girls also happen to love white chocolate. 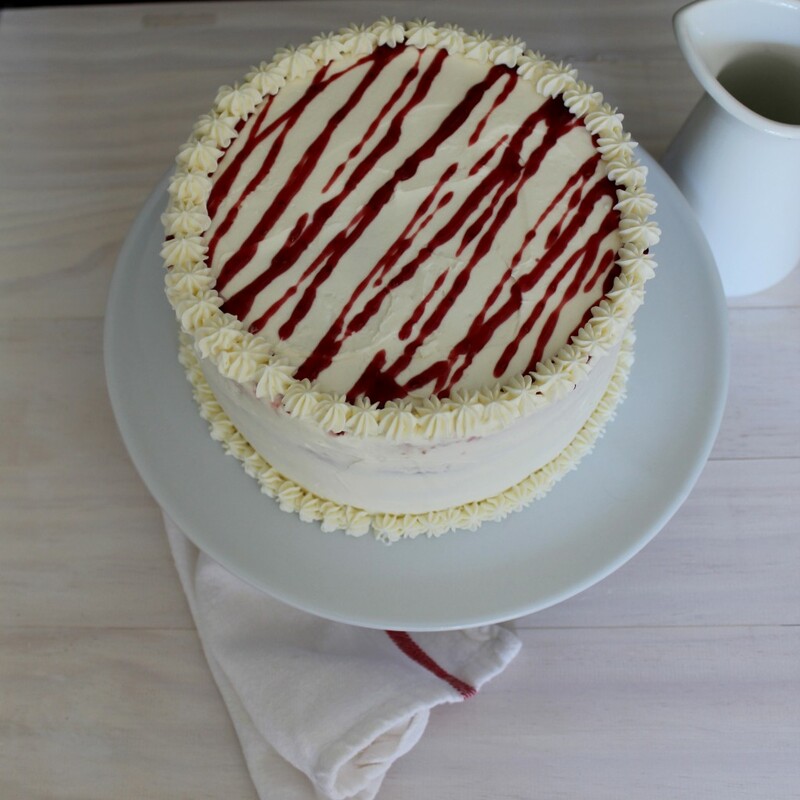 So one day while I was enjoying a crisp piece of toast slathered in butter and homemade raspberry jam, I thought, why not make a yummy vanilla cake and layer it with this raspberry jam. Once I had the inside of the cake decided, I asked my girls what would be a good frosting for the cake. After a lot of silly suggestions (like cheddar cheese frosting and pancake frosting), my six-year old suggested white chocolate. And boy was that the perfect suggestion. White chocolate and raspberries are a classic combo, and it’s for a very good reason. White chocolate can be super sweet, so if you pair it with some tart raspberries, it’s perfection. This frosting is actually a Swiss meringue buttercream. I’ve tried making an American style frosting with white chocolate (butter, powdered sugar, white chocolate, cream, and vanilla), but it always turned out way too sweet. I think the difficulty with an American frosting made with white chocolate is that you have to add even more sugar to an already sweet white chocolate. But that’s not the case with buttercream. While buttercream is also made with some sugar, the whipped egg whites and butter give the frosting it’s silky consistency, not the sugar. So you use much less sugar in a buttercream, allowing for a more balanced cake topping. With a Swiss meringue buttercream, you basically cook your egg whites and sugar before whipping them into a meringue. Then, you add the butter – lots and lots of butter. Give it a good mix, then like magic, it turns into the smoothest, most delicious frosting ever. While this recipe may seem daunting, it’s actually very easy. If you have a KitchenAid mixer, it’s even easier because the mixer does all the work for you! I used my KitchenAid to cream my butter and egg yolks for the cake batter, and my KitchenAid whipped my egg whites into the fluffiest meringue for my white chocolate buttercream. Wanna make this recipe but don’t have a mixer? 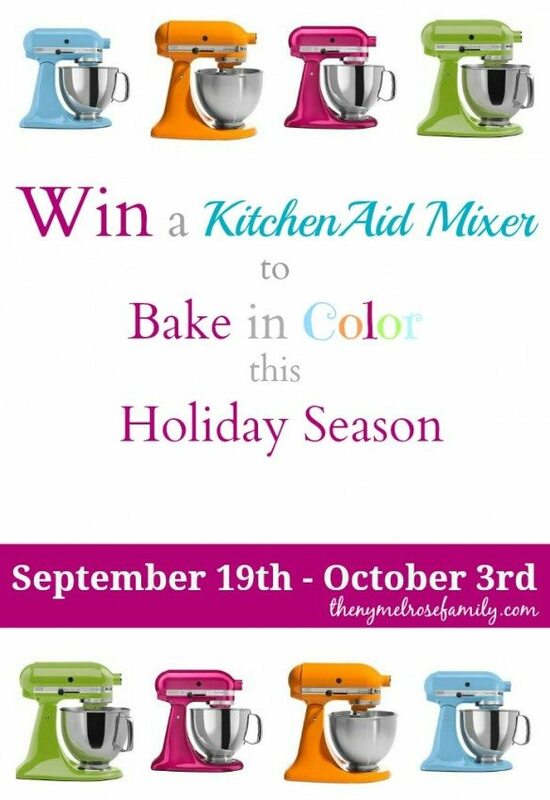 Don’t worry because you can enter below to win your own KitchenAid mixer! This raspberry white chocolate cake is so versatile. It would make the perfect celebration cake, or you could make it for an afternoon tea. I made this one when we went over to a friend’s house for lunch. Their kids are also vanilla cake fans, so it was the perfect treat to share. I wish I had a slice left over to enjoy right now. I may be pulling out my mixer tomorrow to whip up another one! 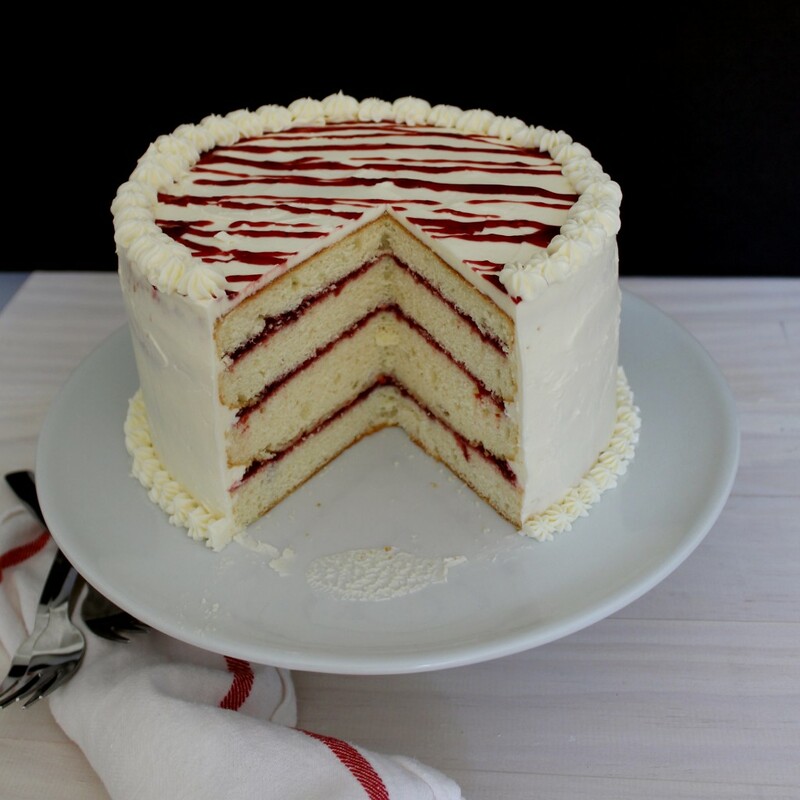 This cake is tender, light, fluffy and packed with real vanilla flavor, filled with raspberry jam and topped with a silky, not-too-sweet white chocolate buttercream. The cake recipe is from Sweetopolita and the buttercream recipe is adapted from Sweetopolita's swiss meringue buttercream. Butter and flour 2, 8-inch cake pans and line them with parchment paper. In a medium bowl, sift the cake flour, baking powder, and salt. Set aside. In the bowl of a mixer fitted with a paddle attachment, beat the butter and 1½ cups of the granulated sugar until it's light and creamy. It will take about 5 to 7 minutes. Add the egg yolks one at a time until just combined. Scrape down the sides of the bowl. With the mixer on low, add the dry ingredients and milk in three additions, starting and ending with the flour mixture. Empty the batter into a large, clean mixing bowl and set aside. Clean the bowl of the mixer. Using a paper towel dampened with vinegar or lemon juice, wipe down the sides of the bowl to make sure it is grease free. Gradually add in the sugar and beat until stiff peaks form. Gently fold a bit of the egg whites into the cake batter. Then add the rest of the egg whites to the cake batter and gently mix until just combined. Evenly divide the batter between the prepared pans. Bake for 35 to 40 minutes (or until a toothpick inserted in the center of each layer comes out clean). Allow the pans to cool on a wire rack for about 20 minutes. Remove the cakes from the pan and allow to cool completely. For the frosting: In the bowl of a mixer, lightly whisk the egg whites and granulated sugar. Place the bowl of the mixer on top of a pan of simmering water. Place a candy thermometer in the bowl. Continually whisk the mixture over the heat until it reaches 160 degrees F or until the sugar is completely dissolved, and the mixture is warm to the touch. Place the bowl in the mixer, and using a whisk attachment whisk the egg mixture until it's glossy, thick, and white. The bottom of the bowl should also be neutral to the touch. If it's even a bit warm and you add the butter, the butter will melt and ruin the butter cream. While the egg whites are whipping, melt the white chocolate. Set it aside, and allow it to cool a bit as the rest of the frosting is made. Once the egg whites are cool and thick and glossy, switch the whisk attachment for the paddle attachment. Continue beating the meringue adding one cube of butter at a time. Add another piece of butter once each piece is completely incorporated into the meringue. Once all the butter is mixed into the meringue, add the white chocolate. Mix until incorporated. To assemble the cake: Once the cakes are completely cooled, divide each layer into two, cutting them lengthwise. Creating a total of four layers. 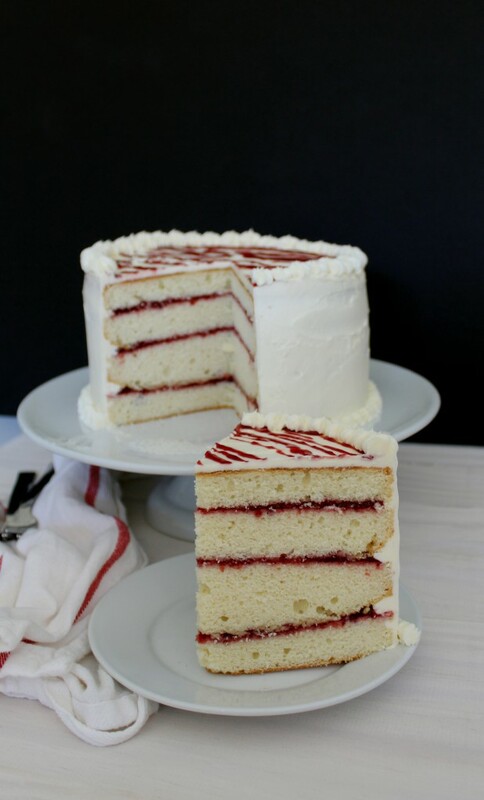 Divide the jam evenly and fill each layer of the cake. Frost the cake with a thin layer of the white chocolate butter cream. Refrigerate the cake for about 20 minutes until cold and firm to the touch. Aida, I saw your cake on G+ and just had to click over to see the details. You sure put a lot of work into this and it’s so gorgeous! I’ve never made a fancy cake like this before, but your instructions make it seem doable. Thanks for the recipe and tell your daughter I think pancake frosting(maybe with maple syrup) sounds divine! Thank so much! Honestly, cakes always look more complicated than they really are. If you can make a cupcake or even a batch of cookies from scratch, then you can definitely make a cake! And you’re right about the pancake frosting. I was thinking of trying it out in cupcake form first! Thanks so much Jayanthi! It was delicious! Yum! Two of my favorite flavors combined. Sounds delicious! I agree with you about the White chocolate in the American style frosting. I’ve done it before and it is too sweet. The Swiss Meringue Buttercream is an excellent idea. I totally agree Vanessa! 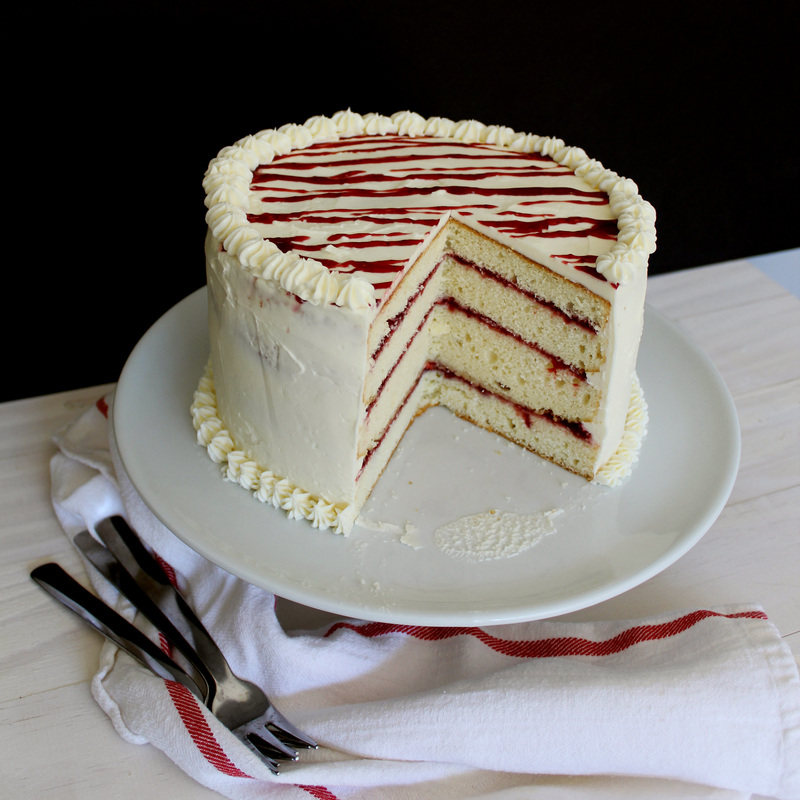 Isn’t white chocolate and raspberries such a great combo? I think Swiss Meringue buttercream may be my absolute favorite kind of frosting. It’s so darn delicious! Wow what a stunner of a cake! Love the flavors too. Gorgeous post, Aida! Awesome cake…………………….Plz pass me one plate. So sweet of you Shobha! Thanks so much! I’ve died and gone to heaven, Aida!! You know this is the cake of my dreams, right? Now you’re just tormenting me! hahaha. Gorgeousness. Another creation of yours that will no doubt be visiting me in my dreams!